When I say “we”, I either mean KoopaTV's staff, or people who use Miiverse. Figure out the context for yourself. I'm the only KoopaTV staffer that actively uses Miiverse, though we all sympathise with what's happening to Miiverse. It's been around since before KoopaTV began, and has been a constant presence for us when writing stuff for the site, whether writing about Miiverse itself (see our first ever Gaming Commentary article titled, “The Importance of Miiverse”) or using screenshots only made possible by Miiverse existing. However, our Miiverse sympathies existed long before Miiverse existed, since five out of six of KoopaTV's staffers (unless Roxy isn't telling us something...) were very active on Nintendo of America's official forum from a previous decade, the Nintendo NSider Forums. NSider was basically the mid-2000s version of Miiverse: It existed off Nintendo's site as their go-to community, filled with kids who lied on their registration forms by saying they're teenagers or adults. Lots of roleplaying happened on NSider, until Nintendo actually went as far as banning roleplaying. Activity Levels Bustling with extremely high levels of activity for its whole lifespan. Dropping for years, and on purpose. I think you can see some commonalities: Both NSider and Miiverse were started with consoles that really needed word-of-mouth boosting, and then were ended at a time where the new consoles had a lot of trouble even staying on the shelves for a couple of minutes. Additionally, no one who was using NSider or Miiverse was/is happy about it being shut down, and they expressed their thoughts very vocally. As someone who was there, I can tell you that the outcry from Miiverse users does not compare to the outcry from NSider users, so to anyone who says that you can get Nintendo to reverse their decision? You're wrong. It's been tried before, and much stronger. That said, there are many key differences. Nintendo has learned a bit from a decade ago — obliterating potentially great content — and friendships — off the planet all of a sudden is not a good idea, and it really pisses people off. They are actually giving a warning in advance this time, instead of users waking up to an apocalypse. While it's unclear to this day why NSider had to close (reportedly, the admins got sick of dealing with ungrateful little kids), Nintendo's stated reason for Miiverse closing is that Facebook made it irrelevant. It's all Facebook's fault. 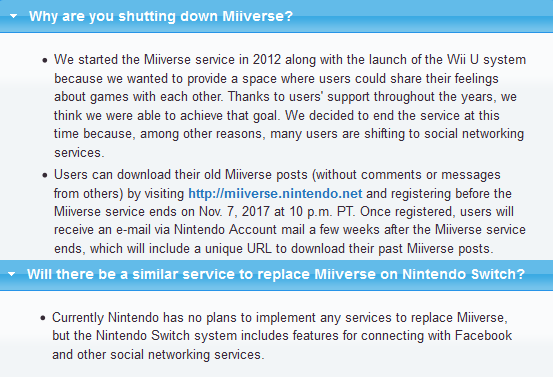 Source: The Miiverse Service Discontinuation FAQ. Facebook is very, very different than Miiverse. For one, Miiverse is much more like a forum with many boards than a crappy, rigged timeline that isn't based on chronological order. Miiverse was designed for gamers, and for making new friends. On Facebook, you can get banned for trying to make new friends by sending friend requests to people you don't know. Facebook is for keeping in touch with existing friends. Miiverse is for actual discussions around specific topics among like-minded people that you can become friends with. People on Facebook really don't want to see all of your Splatoon 2 screenshots or The Legend of Zelda: Breath of the Wild feats. Miiverse members will eat that up. Oh well. With every generation comes Nintendo ruining the lives of those that have depended on it. I, for one, probably won't learn from the experience, and next time in a decade when Nintendo makes a new forum-esque service, I'll be on it. Once Miiverse actually closes, KoopaTV will have a Miiverse-specific tribute to the fallen service. In the meantime, the author of this article's NNID is PrinceOfKoopas over on Miiverse. He's well-aware that he has been representing himself and Koopa Kingdom before many of Miiverse's users were even born. Consider this yet another reason to hate Facebook, which is also different in that it would ban someone for being named Ludwig. Ludwig conducted an interview with Nintendo about more details regarding downloading your Miiverse post history. November 8 has passed, and Miiverse is gone. May we consider change.org fake news? I am so sick of this website being mentioned including Miiverse. So many misled kids thinking this site will do anything to save Miiverse. As much as I don't like change.org (though they have a great top-level domain), it's not FAKE NEWS. It's a tool. Whether it is useful or not depends on the people who use it. It's useless in terms of Miiverse. It may be useful in other contexts, some of which are documented on change.org's homepage. I don't understand Nintendo's decision to not support Miiverse with the Switch. Regular social media isn't the same. Even just from a screenshot perspective. I think nothing of saving screenshots to Miiverse to use them later, but I felt weird tweeting screenshots. Maybe they just don't want to run a form of social media. Anyway, yeah, that's why I have a dedicated and private social media account just for dumping Switch screenshots. It's inefficient.